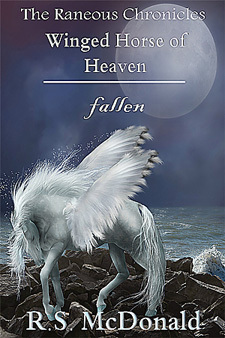 Winged Horse of Heaven-Fallen is the first book of the Christian Fantasy series The Raneous Chronicles . Many readers are surprised by this book as it seems to be a fun fantasy about a winged horse — and it is, but it’s so much more! Fallen actually begins the tale of a young idealistic colt named Raneous who is pulled out of his heavenly realm into the mortal realm of the Shadowlands. His struggles against evil, his fears and his triumphs as he seeks to return to his home endear him to our hearts. Themes of abandonment, abuse, forgiveness, friendship and coming of age run throughout this tale making it universal in its appeal to both the young and the adult reader.